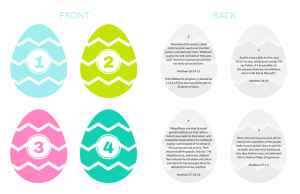 12 Eggs of Easter Printables |Christ-Centered Easter Activity - So Festive! This Christ-Centered Easter Tradition is a simple way to teach your family about the true Easter story. Cheerful printables and activities make teaching children about Easter fun and meaningful! Need a simple and fun way to bring Christ back into Easter? Keep reading! A few years ago, I realized that my family wasn’t giving enough attention to the real meaning of Easter. Don’t get me wrong. We love the Easter egg hunts, finding baskets and going on an Easter picnic – one of our 6 favorite simple Easter traditions. But aside from the fun of Easter, I wanted my children to KNOW that Easter means we have a plan of happiness and can live with our family members again after we die. That brings me great comfort since my own mom died when I was 15. This kid-friendly Christ-centered Easter tradition focuses on Jesus Christ and His resurrection. The 12 Eggs of Easter uses 12 different parts of the Easter story and combines them into a fun and interactive way that children can learn what Easter is really about. The 12 Eggs of Easter will walk you and your family through the important events of Christ’s last week on Earth. Choose one night before Easter to do this family activity. For our family, we usually do this on a Sunday or Monday evening when we have more time together. Hide all the eggs. Have family members find the eggs and then gather back together to open the eggs and talk about the Easter story. Have all the eggs in a basket and take turns opening the egg and reading the scripture verses that talks about the symbol in each egg. Similar to a 12 Days of Christmas, you could do a 12 Eggs of Easter, where you open one egg each day on the 12 days before Easter. Choose whichever way will work best for your family! 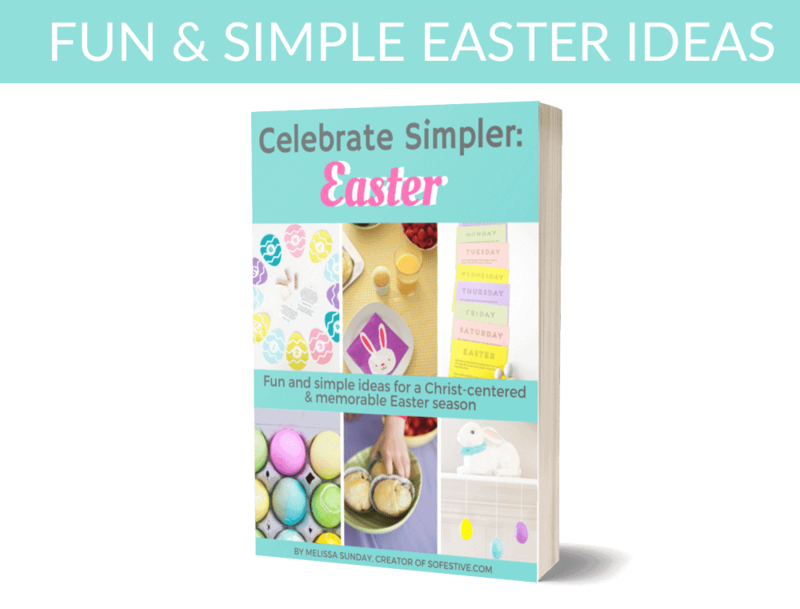 This Easter activity with printables can be found in our 30-page Celebrate Simpler: Easter Ebook. If you’d like all the fun ideas in addition to this one, get your copy here! 12 Eggs of Easter Companion Cards that include the description for each object. You can get a download here. Once you have gathered the eggs and symbols and printed off the Easter Egg Story Companion Cards, you’re ready to assemble! Place each object into a plastic egg. If possible, find an Easter egg that matches the color of the card so that the cards and actual eggs will correspond. This isn’t necessary, but it will help you keep track of all the eggs easier! Laminate the cards. I invested in an inexpensive home laminator a few years ago that I used to laminate these Easter cards so that they last year after year. if you don’t have your own laminator, I highly suggest taking it to a copy shop to have done! 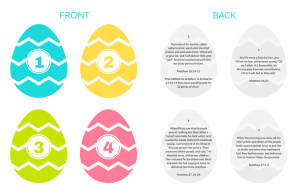 If you’re interested in getting the Easter printables to make this activity easy to put together, get an instant download here that has printable cards for each day including the scripture verses and object. Quick reference list with object list and scripture verses. With the eggs full, you’re ready to start a Christ-centered Easter tradition that is easy to pull out year after year! I hope you have a wonderful, Christ-centered Easter season! Melissa, this is perfect! Thank you so, so much for sharing. I will definitely be using this with my boys this year! Love this! I wish I’d seen this sooner for my sharing time today, but I am most definitely doing this with my family!